After Beauty and the Beast (2017) and later Pirates of the Caribbean: Dead Men Tell No Tales (2017), Guardians of the Galaxy Vol. 2 is the third film that I’ve been anticipating early this year. It’s been three years since the first film and that’s why I’m excited about the sequel. I have to say, Guardians of the Galaxy Vol. 2 does not disappoint the audience. I really love this film a lot. It may not be the best Marvel film, but it certainly is the funniest. Ever since the teaser trailer was released, Baby Groot has stolen the spotlight. He certainly is way cuter than in Guardians of the Galaxy (2014). Although in the first film, Groot is attractive in its own innocent way, but in this second film, Baby Groot has become way more attractive. His innocent looking face is still the face but since the size has been reduced to a baby, he becomes cuter than ever. At first, I thought Baby Groot was used as the imaging of the film to attract more attention. But I was wrong. Baby Groot also took part of important things to but in his innocent way, like in the first film. So no, Baby Groot is not just a display to make the film more attractive, because he also played an important role too. He has become the centre stage. However, I can’t deny the fact that Baby Groot has indeed made the film even funnier with his innocent baby face and all. In this Guardians of the Galaxy Vol. 2, Peter Quill found his long-lost father and of course, the story evolved from there. The Guardians also found new enemies and new friends as well. If I have to compare, this film is way better than the first film. Not because the plot story is better, but I think because the entertaining factor in the second film is better. I like films with many comedy because who doesn’t love to laugh, no? However, if I have to compare between the plot, I can’t say which one is better. I realise most people love the original story from first films but some also love the sequel. Which one is more complicated, I can’t say. In the first film, the Guardians were not yet a team and they hated each other. They found it difficult to work together at first. But through thick and thin, they managed to help each other and work as a team. On the contrary, in this film, they have become a team and now the problem is how they stay to work together. Adjusting one another. Fighting each other, betrayal and all is undeniable, thus making the story more complicated because betrayal in our midst is more hurting than any kind of betrayal. There are some pluses and minuses in both films. 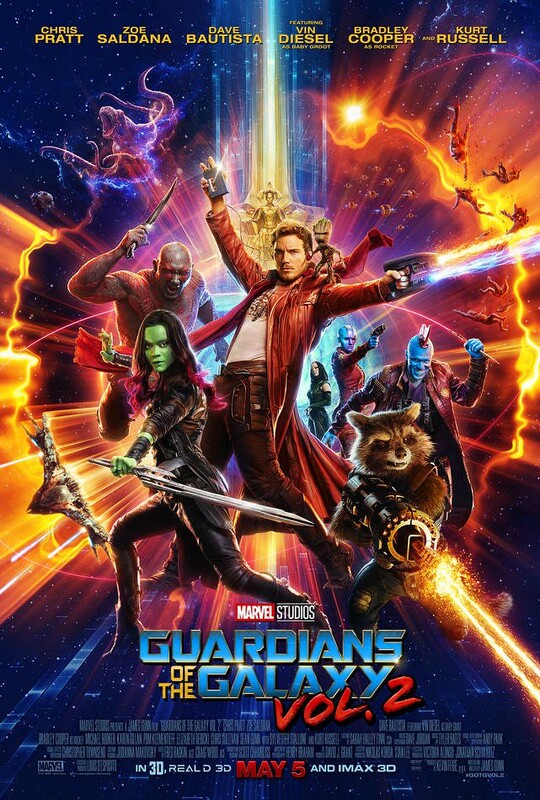 I can’t compare this film with the comic book since I never read the comic books, but as a film, Guardians of the Galaxy Vol. 2 is already entertaining enough, especially for someone who never read the comic like me. So whether the plot story is worse or better than the comic book or how different the plot story in the film from its comic book, I honestly don’t know. Putting aside the fact that it was based on Marvel comic books, I think you can pretty much enjoy the film very much. If I have to say which film is funnier, this second film is of course, funnier. It’s undeniable that Guardians of the Galaxy Vol. 2 will make you laugh a lot. Laugh out loud until your stomach even hurts or some tears came out from your eyes. Yes, it’s possible. There are so many factors that made the film very funny and it’s not about Peter Quill or Baby Groot but Rocket, Mantis, and Drax also made the story funnier. The action is still thrilling. All the bombing, the explosions, the fightings, and all, are still entertaining as ever. The CGI effect is perfect. Not too much, but not too little that made the film poor. Everything is in portion. I won’t be surprised if they were nominated for the visual effect because the production team has made a beautiful visual effect for this film. It’s no doubt that Chris Pratt can always entertain us with his humour. However, he can also do some serious action as well. Some even invite you to tears. I always amazed with Zoe Saldana. She never plays normal roles. All her roles are unique, including Gamora. I bet she needed at least eight hours to do the makeup before going to the set. I’ll say the same to Dave Bautista and Michael Rooker as well. Dave Bautista as Drax is funny. He looks scary and serious at first, but who knows that he is actually very funny. As for Michael Rooker, well of all the characters in Guardians of the Galaxy, I always love his character’s power. Yondu and his whistling arrow were super cool. If you can’t see how cool he was with his power during the first film, you are definitely going to see it a lot in this film. I have never really watched Kurt Russell’s films before. But he has a tremendous job in playing the character of Peter Quill’s father. Marvel has been taking major actors these days, seeing that now superheroes films are very popular, unlike say, one decade ago. It’s no surprising now that many actors and actresses also want to join the cast of superheroes films. We can’t lie that nowadays, being in a superheroes films is kind of cool and no longer ridiculous. Marvel films have become huge success each time the studio released a film. Marvel films have become one of those films that were waited by their fans, even non-fan either. I am still wondering how Rocket understand what Groot was saying. They all are the same “I am Groot” to me. Nevertheless, the interaction between the two of them is very funny that I don’t care how the hell a racoon can talk and how he understands what a ‘tree’ was saying anyway. This is a film anyway, so not everything has to make sense. However, I have to admit, it won’t be funny again if Groot didn’t speak his iconic words “I am Groot” anymore because to be honest, that’s what made Groot, Groot. The new member, Mantis, also added some laugh to the team. Even though she still hasn’t played a bigger part like the others, I’m still looking forward to her role in Avengers: Infinity War (2018). Of course, when we are talking about Guardians of the Galaxy, we have to talk about the music. Guardians of the Galaxy is always special in terms of music because they used old songs. The choice of the songs fit the story really well that we as the audience don’t mind if the songs are old. At least I don’t. I wasn’t born in the 80s but the songs really feel a bit nostalgic. It is indeed a smart move to use old songs like those, thus making Guardians of the Galaxy different from other Marvel films. I am also surprised Sylvester Stallone made some scenes in the film. Even Michelle Yeoh too! Marvel has never ceased to surprise us after all. Like any other Marvel films, Guardians of the Galaxy Vol. 2 also has mid and after post-credits scene. This time, they give us five post-credits scenes! So make sure to not leave your seats before the end of the credit. You won’t be disappointed. All in all, Guardians of the Galaxy Vol. 2 is an entertaining and exciting film. I can’t say if it’s better or worse than the first film, but I really enjoy the film very much. It made me laugh out loud a lot when I watched it. This film is definitely funnier than the previous film. I still like Doctor Strange (2016) or Iron Man, but this film surely has caught my attention. I am very entertained by the humour. Therefore, I give Guardians of the Galaxy Vol. 2 9 out of 10 stars.